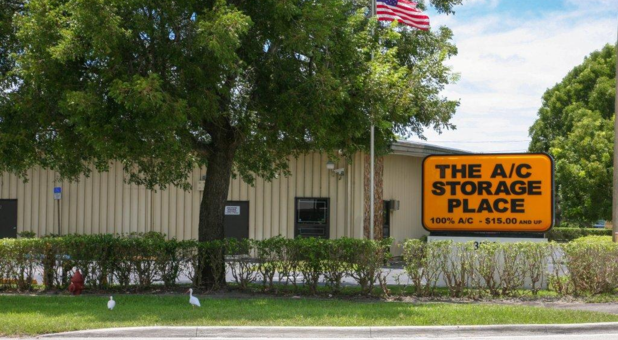 The A/C Storage Place has been serving Boynton Beach, Florida for more than 35 years. We’re the go-to storage solution for communities such as Delray Beach, Ocean Ridge, Gulf Stream, Dunes Road, High Point, and Kings Point, so we’re confident we can handle just about anything you bring our way! For your convenience, our office is open from 9 a.m. to 5 p.m. every day of the week. Whether you need help choosing a storage unit or you have a question for our team, we’re available to assist you. Find our property next to Marathon Greek Foods and near South Tech Academy, Crosspointe Elementary School, Caloosa Park, Tire Kingdom, and Goodwill. We offer 25 storage unit sizes, allowing you to find the one that’s a perfect fit for your belongings. No matter which rental is best for you, you’ll have access to it every day of the week from 9 a.m. to 5 p.m. All of our spaces are located on the ground floor, eliminating the hassle of moving your belongings up flights of stairs! Actually, we’re dedicated to removing as much hassle from your experience as possible. While other storage facilities wait until you’re signing your lease to tack on administrative fees and deposits, we never charge unnecessary fees. We even refund prepaid rent if you move out before the month is up! While our prices are affordable, they include some of the best features in the industry, including pest control twice a month, aisles that are swept and mopped daily, ventilated siding, and 100% air conditioning. Our building is monitored by the local police and fire departments, so you can rest assured you’ll feel safe storing with us. Give us a call today to get started!